Saturday, August 1st we will post about our July reads, so please check back! We want to hear about everyone's choice and get links to your book review (if you wrote one). 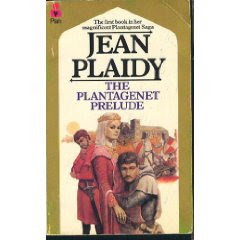 Our August pick is The Plantagenet Prelude. "The King, the Queen and the archbishop who dominated the dawn of the Plantagenet epoch. Eleanor of Aquitaine -- romantic and beautiful Queen of the 'Courts of Love', scandalizing Christendom by her infidelity to her husband the King of France. Henry, Duke of Normandy and great-grandson of William the Conquerer. When Eleanor saw him, twelve years her junior, she was determined that Henry should be her husband. Thomas a Becket, the merchant's son, who rose to become a saint and a martyr. Beloved and hated in turn by Henry his king, Becket's course moved inexorably toward the tragedy of blood and steel before the high altar at Canterbury." I loved The Plantagenet Prelude, it is my favourite Plantagenet so far.